You will earn 21,685 Reward Points. Earn 1 reward point for every 1 dollar spent. 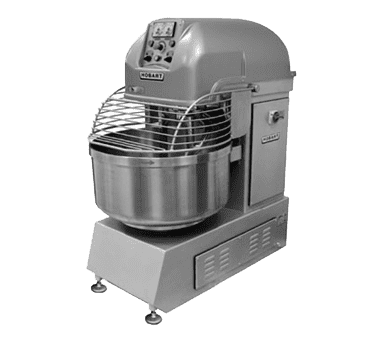 The Hobart HSL180-1 Spiral Mixer is perfect for creating high-quality dough in your restaurant, bakery, pizzeria, or other establishment. It includes a 180 lb capacity stainless steel bowl, wire-form bowl guard, spiral dough hook, and breaker bar. It also features manual and automatic control functions, two fixed speeds (plus reverse) with two 20 minute programmable timers, bowl jog control, and adjustable feet with front and rear casters. With a 6 hp spiral arm motor and a .75 hp bowl motor, this unit uses a voltage of 208-220/60/3. With the easy-to-use Hobart HSL180-1 Hobart Spiral Mixer, you can mix a large number of ingredients in a flash. It uses a voltage of 208-220/60/3. Arguably its best feature, this item has a capacity of 180 pound.